Democracy is a curious thing. In an interesting article in the NYTimes today, it is noted that experts have a clear idea of the 'what' and 'how' of protecting New York's harbor in the wake of hurricane Sandy and the rising seas as a result of global warming. Getting the job done? Well...that is a whole other matter, since it can be very difficult implementing big projects in a our current political system. Was it ever thus? 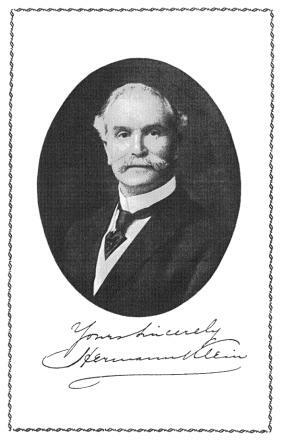 When Herman Klein came to New York from London, England, in 1901 and within a few years became the first Chairman of The National Association of Teachers of Singing in (the organization that now bears this name was founded in 1944 after the original organization changed it's name to The New York Singing Teachers Association in 1917), he also carried with him the notion of creating a national standard for singing teachers in America. That he had the blessing of his teacher, the great singing master Manuel García, mattered little. Klein couldn't get the newly formed organization to stand behind standards even though its members had arrived at a consensus of what those standards were. Instead, a small group decided to start a school to educate its members and the public. Of course, we know how far that went. Klein's vision was a simple one. What would have happened had it been implemented? Would American vocal pedagogy be any different than it is today? We hear a great deal from all sides of what the average singing-teacher is not — less, perhaps, than we should of what ht actually is, and less still of what he might be. Take him for all in all, he has a poor reputation in this country — so poor, in fact, that if the police acted literally on the principle of "Give a vocal teacher a bad name and hang him," there would ensue a considerable reduction in the musical population of our large cities. I am not here today to defend teachers of singing as a body, for the simple and sufficient reason that there is no " body " yet to defend. If I am called upon for any kind of defense at all, it is in behalf of a small and modest, but compact, section of singing-teachers, who realize, like Marcellus in "Hamlet," that there is something rotten in the State," and are at the present time earnestly and anxiously devising plans whereby to purify and systematize the work of their profession as a whole. The first duty of the one who would cure is to correctly diagnose his case. What is the matter with the vocal professors? What do they lack? And wherein are they guilty of shortcomings that cannot be laid at the door of other musical pedagogues? To begin with, speaking now as a critic and not as a teacher, I find this profession suffering from all the troubles that arise through the non-existence of a standard which would enable them to guide and direct their work and measure its progress. They bow to no authority; they acknowledge the right of no man to question the efficiency — nay, the infallibility, of their methods; they refuse to shoulder the blame for any failure that may result from the application of those methods. The teacher of singing is a "free lance" in the literal sense of the term. He is at liberty to use what weapons he pleases, and there is no law in any country, civilized or uncivilized, that can prevent him from wielding them after his own fashion, whether to the advantage or to the serious detriment of the community. Now, the art of singing is no more an exact science than that of the licensed healer or physician. But there is this great difference between the conditions governing the two, that, whereas the surgeon who betrays carelessness or incapacity in the performance of an operation is liable to be sued for damages, the vocal instructor who injures the throat or lungs of a pupil cannot be made subject to any kind of legal redress for the outcome of either his ignorance or his unskillfulness, or both. It may be long before the laws are altered in this respect. Meanwhile what is happening? This "free lance" goes on his way, rejoicing in his freedom, conscious of a glorious immunity from the dangers of retribution, and more than ever anxious to demonstrate the impeccability of his aforesaid weapon or method. It is precisely this sense of freedom that engenders the sense of irresponsibility which lies at the root of so many evils in the department of vocal pedagogy. The teacher may have a perfectly clear conscience, because he may honestly believe that he is teaching in the right way. He may even succeed when his method is not right; for there are voices that are impervious to wrong ideas, that will develop with strength and volume because of their inherent robustness and power, in spite of harmful or futile suggestions from their trainers. But the danger then is only greater still; for the teacher will naturally credit himself with this success, and will proceed to apply the same faulty ideas to other pupils, whose organs will simply crumble and collapse under his treatment. It has been asked, to what extent and in what essentials does the vocal teacher differ from any other teacher of music? That question may perhaps be best answered by an authority in the ranks of your own Association. I feel, however, that there is a difference, due to a good many causes, partly educational, partly environment, partly temperamental, and partly the unsolved problems of the hidden instrument which evolves the human voice. For lack of musicianship there can be no excuse. A man need not be able to play accompaniments to teach singing well; but if he cannot read at sight, master rhythms, or interpret a vocal score, be he himself ever so good a singer, he is as little fitted to teach his art as was the parrot-chorister of Italian Opera in bygone days. The instrumental executant should, nay, must, begin study at an early age, thus ensuring early musical education and perhaps environment also. The vocal student, unless he be a choir boy, cannot begin until much later in life. By that time he may, of course, have received a liberal education or even possess some culture. On the other hand, he may have worked in a grocer's store or in a coal mine or, like Wachtel, the tenor, have driven a cab. Lack of culture and intellectuality will generally suffice to account for lack of dignity in a musician; and the teacher who forgets what is owing to himself in the matter of polish -and refinement will surely forget what is owing to his pupils and the members of his fraternity. But, after all, the most destructive of these differences are due, not so much to the individual, as to the difficulty which besets every teacher of singing — namely, having to handle an instrument whose mechanism is concealed and whose varieties are countless and infinite. How shall we best proceed to study and vanquish the technique of an art whose secrets demand the labor and experience of a lifetime? How shall we best contrive to create a practical standard for the measurement of our teaching ability? How shall we best protect the public of this country against the harmful incompetency of the ignorant, incapable, pretentious professors of singing who abound here? These are precisely the questions that are now exercising the minds of the leaders of the National Association of Teachers of Singing. The Executive Board of that body, of which I have the honor to be chairman, has been for some time, and still is, working hard to formulate the right kind of examinations for the certificate or diploma which the Association will have the privilege of issuing to successful candidates. We know two things:— First, that we can only obtain prestige for our diploma by making it the guarantee for sound, reliable teaching; and second, that we can only obtain the demonstration of ability from our candidates by submitting them to tests that shall be broad in principle, simple and direct in form, practical in their nature, and based upon those clear fundamental ideas of the vocal art which the exponents of every school are more or less bound to entertain in common. We shall find a road to unanimity of idea and purpose, and along that road our cause will surely triumph. Our task of preparation being still incomplete, I cannot give more than a bare outline of the subject-matter we propose to cover in our examinations. Our intention is to avoid as far as possible controversial questions, whilst seeking to bring out the actual knowledge and fitness of the candidate for the work of teaching. Laying down no arbitrary laws ourselves in regard to methods of imparting this great and difficult art, we shall not endeavor to impose them upon a later generation. (For, after all, it is to the future, far more than the actual present, that we are looking in our efforts to separate the wheat from the chaff. We shall expect a candidate to show understanding of the laws that govern (1) Breathing; (2) Clear, steady emission of tone; (3) Muscular control of the tongue, palate and larynx; (4) Training of the ear for pitch and quality; (5) Formation of a smooth, even scale; (6) Enunciation and diction; and (7) Diagnosis. We shall give credit for antecedents, training and positive teaching experience; and, if the candidate be a singer, his or her display of vocal art will materially affect the judgment of the examiners. But, above all, we purpose having the candidate diagnose a strange voice, indicate the line of teaching which it requires, and proceed to give a lesson in our presence. Under these conditions no serious mistake ought to be possible. Our plan is to eventually grant certificates to workers in special branches, but at the outset we think it better to examine for general ability only. This is partly because it will take time to thresh out our ideas, so as to arrive at a common basis of agreement concerning what is right and what is wrong, what is helpful and what injurious, in the various departments of vocal teaching. We shall leave nothing undone to attain this end, and we even hope to ultimately clear the ground of the existing confusion in terminology or nomenclature, whereby intelligent thinkers are constantly being placed in apparent opposition and variance of opinion through calling the same thing by different names. To accomplish this, we must agree among ourselves; and Utopian as the scheme may sound, to ears accustomed to the thought that singing-masters disagree more woefully than doctors, I hope and believe that, by dint of a constant healthy interchange of rational ideas, and a determined avoidance of acrimonious or heated discussion, we shall emerge from the present state of affairs with advantage to our art and honor to our profession. Papers and Proceeding of the Music Teachers National Association, 1907, Published by the Association, 1908. This is as applicable and fresh today as 105 years ago. Thanks for posting this. Thank you for your comment, Brian. It's interesting to me that Klein's words still resonate, and not always in a way that pleases people. Case in point: I made this post the subject of discussion on a singing teacher's forum, and have observed from the comments made that 'standards' are regarded with suspicion. Of course, the irony is that we never seem to have this attitude when we go to the doctor or the supermarket. Perhaps this points out how making music- and singing especially- is inextricably tied to our conception of self.